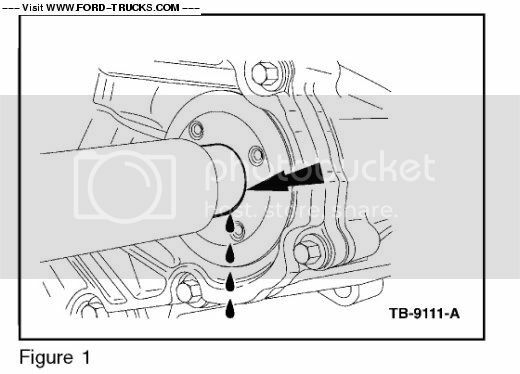 A common complaint of Ford’s line of vehicles that have AWD is an oil leak from the right front axle shaft. 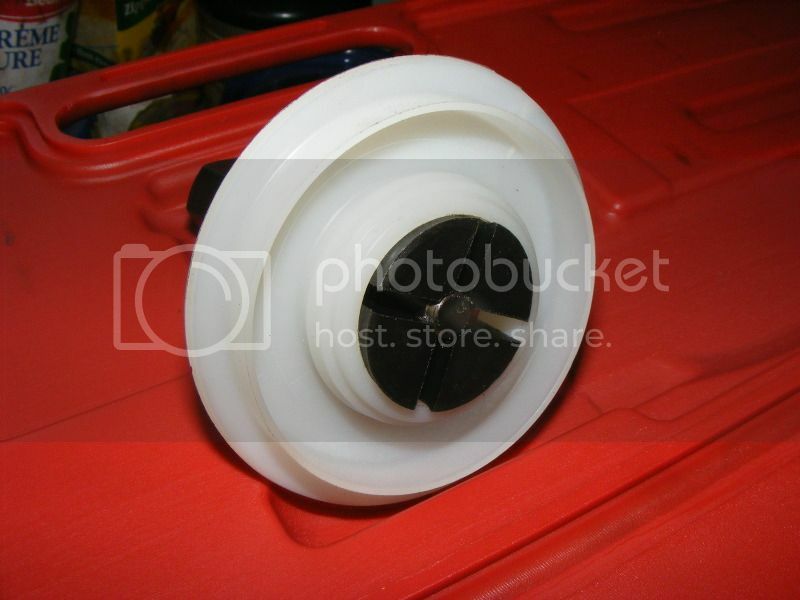 This leak can take on two forms, and depending on the oil that’s leaking will indicate which seal is shot. This specific problem is limited to vehicles with all wheel drive. On AWD vehicles there is a device called a Power Takeoff Unit (PTU) bolted to the Transaxle. The PTU’s job is to take power from the transaxle and send it out towards the rear axle by a driveshaft. There’s nothing fancy inside the PTU… Some gears to deflect rotation 90°, bearings and seals in a housing. The gears and bearings sit in a oil bath of synthetic 75w-140 gear lube. The PTU is constructed so the right side intermediate axle shaft passes through from the transaxle differential out to the passenger wheel. 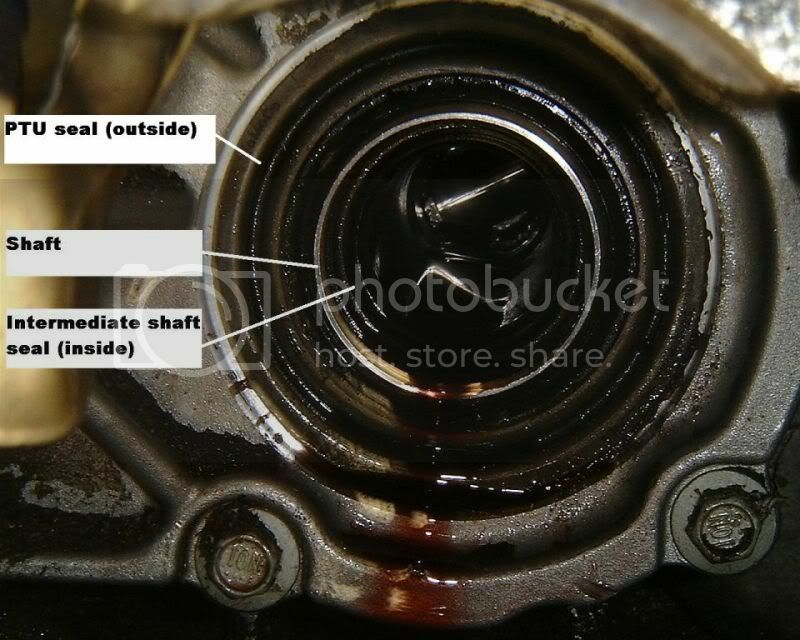 This is where the problem is….Where the intermediate shaft enters the PTU an oil leak develops. Normally, a small oil leak on a vehicle isn’t such a big deal. 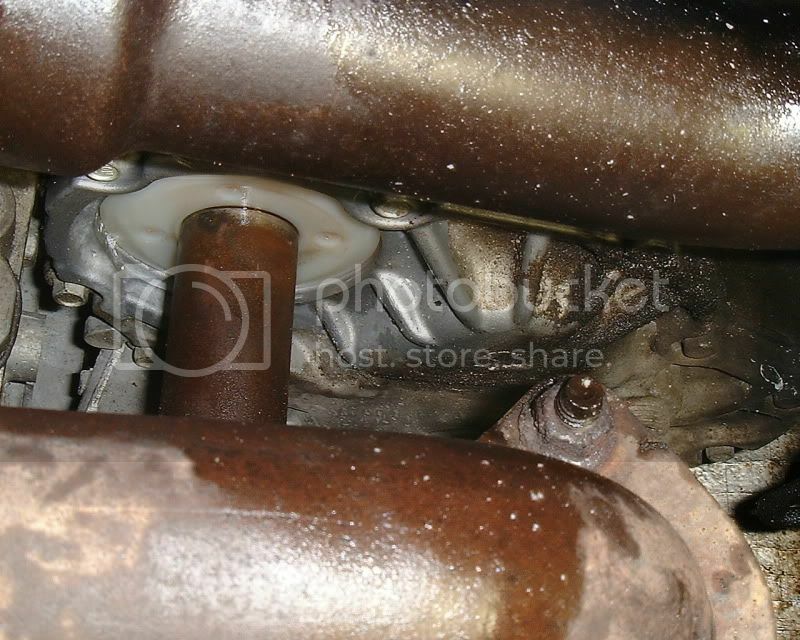 The odd drip here or there will go un-noticed but on Ford’s AWD vehicles this drip is directly above an exhaust pipe. When the oil drips down onto the hot exhaust it creates some very noticeable smoke. This smoke will usually flow up and into the HVAC air intakes causing the cabin to fill up with a very unpleasant (and unhealthy) smell. Health and safety concerns from this are from the oils that vaporized may be toxic and carcinogenic. The deposit of oily film it leaves on the inside of the windshield can obscure vision and create a hazard driving when the sun is low on the horizon or at night. Not to mention the distinct possibility of fire. Those with warranty will have the repair covered but Ford still insists to downplay these defects claiming it’s not that widespread. 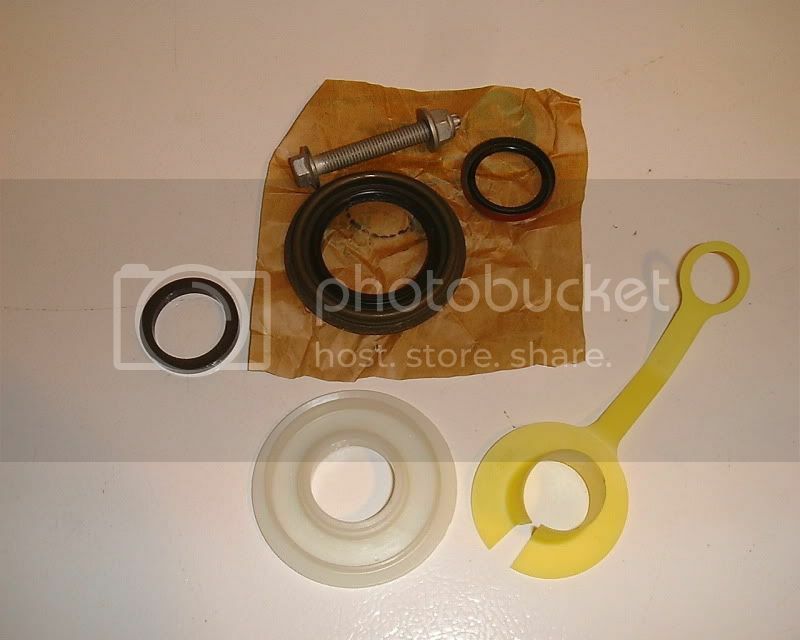 Several revisions for the seal repair kit are proof that Ford knows about this problem. A recall or extended warranty for this defect is in order. Ford needs to step up and fix this now. I wanted to write this DIY for all those Taurus X and Edge owners out there that have vehicles that are out of warranty just like me. As these cars age this repair will become more needed. Taking it to the dealer is costly and not always an option. Also, it’s been reported this defect relentlessly carries on into the 2011 model year. The leak takes on two forms. 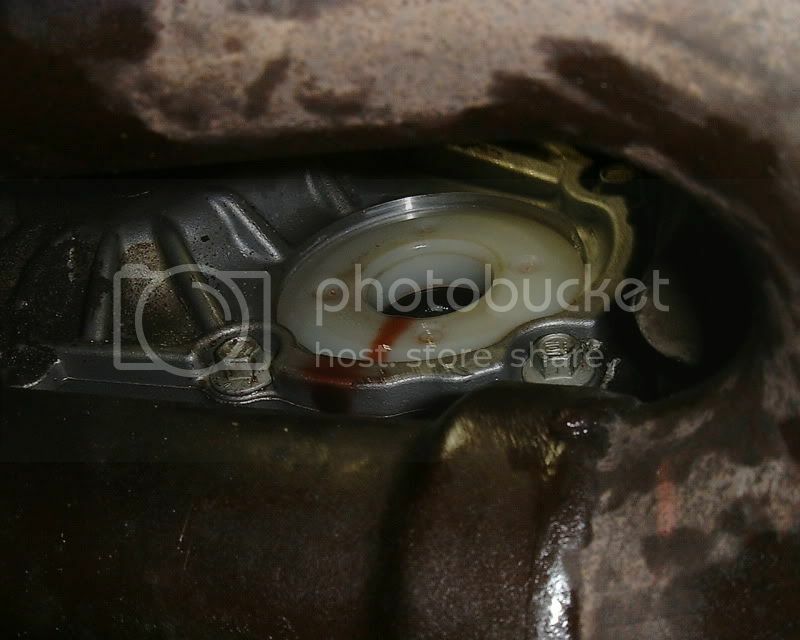 To know which seal is leaking, you’ll have to visually inspect the intermediate shaft on the passenger side. The color of the oil is the best indicator. TSB 09-25-7 has a Diagnosis section that details where and what to look for. 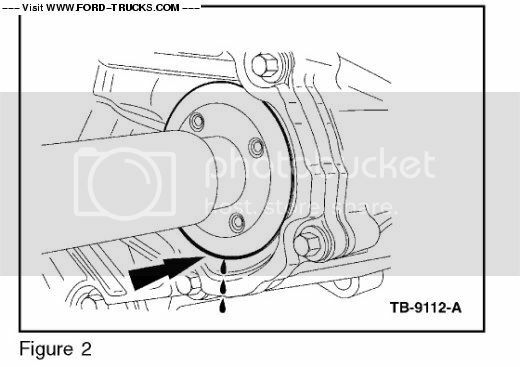 Essentially, if the oil is red then the intermediate shaft is leaking ATF (figure 1 in TSB 09-25-7). If the oil is brown/black then the PTU seal is reported leaking (figure 2 in TSB 09-25-7). Edit: When I originally posted this I forgot to add pictures of what the leak looks like. Here's a couple showing the typical leak. 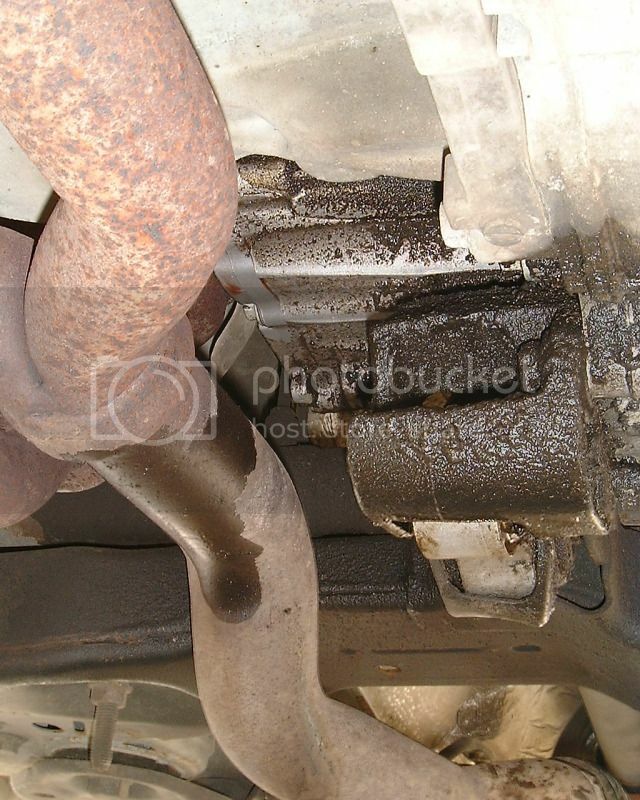 The first shows the exhaust pipe wet with oil that's dripped down. This is what causes the smoke in the cabin. Depending on how fast you're traveling or which way the wind blows, this smoke will get sucked into the vehicles HVAC and into the cabin. This shows the leak itself. Notice the area is soaked with oil and is washed clean where the drip is. In my case the oil is red which indicated transmission fluid and NOT PTU fluid. 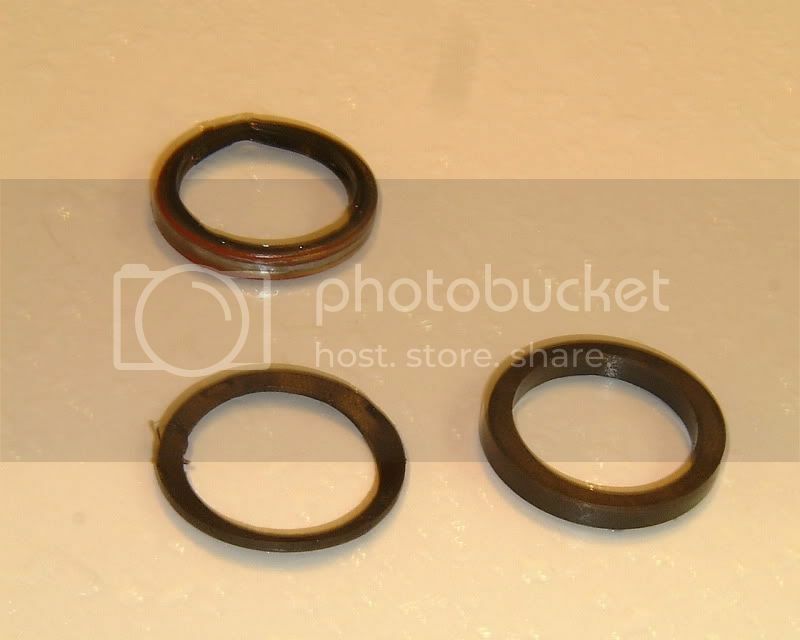 Which seal kit to order will depend on the color of oil and where the leak comes from. In this DIY I replace the intermediate shaft seal only and leave the PTU untouched (because it wasn’t leaking). If you want to change the PTU seal it is STRONGLY recommended to replace the intermediate shaft seal at the same time even if it’s not leaking. 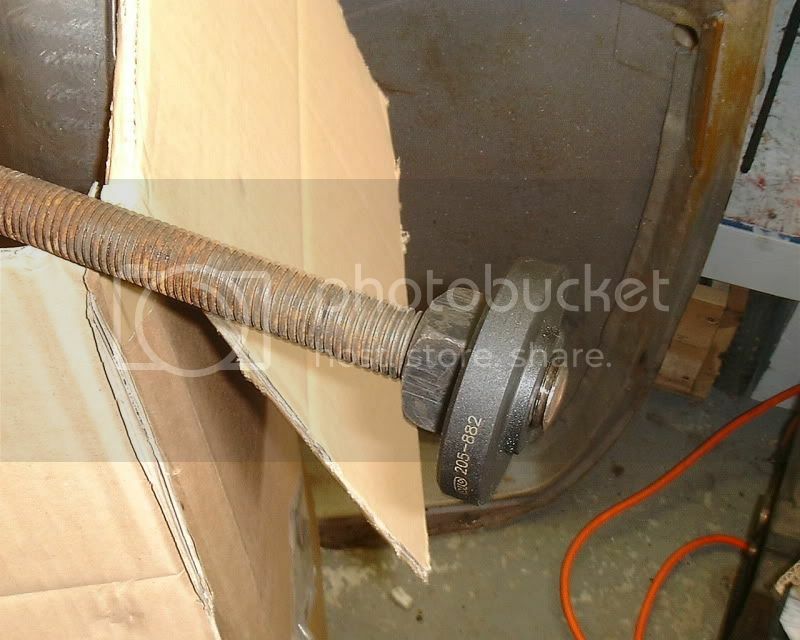 The reason is removal and replacement of the intermediate shaft will damage the seal from the splines. Installing a new intermediate shaft seal is the only way to assure it won’t leak after you assemble. But this from the dealer ($$$) or get it online for much cheaper but pay shipping. Maybe you’ll find a place that ships free if you order over $50. Just buy some oil and air filters to make up the difference. I actually ordered 8T4Z-7275-DC and they sent me –DD, maybe a revised seal kit? Funny thing, this seal kit cost me $18.00 where –CD (includes the PTU seal) was only $11.50??? More for less? Perhaps they screwed up on part numbers. Regardless, I got the seal kit and it worked. 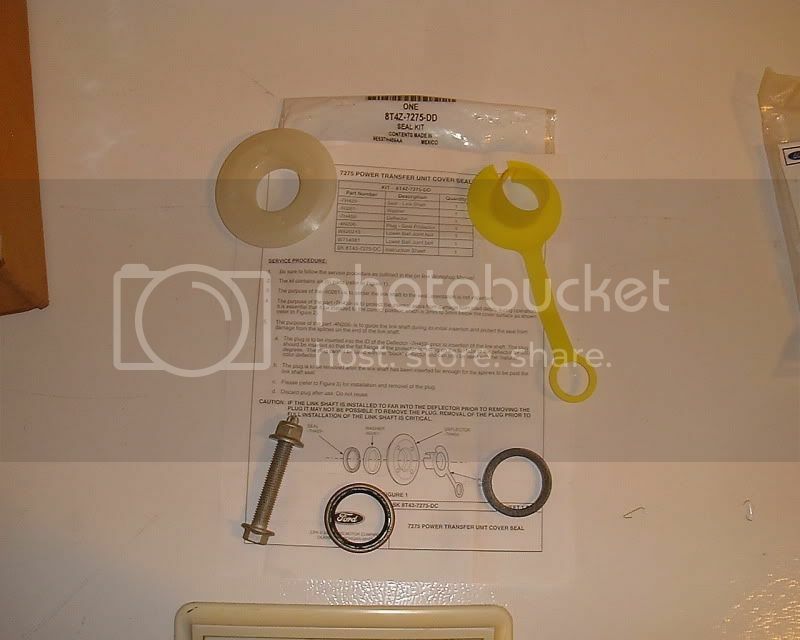 Here’s a picture of seal kit 8T4Z-7275-CD. It has all the above parts but includes the extra PTU seal. When you pull the intermediate shaft some oil will come gushing out and all during the time the shaft is out it will continuously drip. Expect to lose about 2 liters of ATF. Make sure it’s the correct type for your vehicle, it must be MERCON V or equivalent. These two special tools are for installing the seal and deflector. 205-883 installs the seal at the correct depth and ensures it’s in the bore straight. 205-882 installs the deflector and without it the chances of breaking the new deflector are high. Strongly recommend having these two tools before starting. I bought mine new but you can find used ones out there for less than half the cost of new. When I give up the Taurus X, I plan on selling these to recoup my costs. The OTC tools are very high quality and have lifetime warranties. If you know somebody that has a lathe and can spin some aluminum stock, you could make them for very little cost. Attached is a drawing if you're so inclined to make these tools. 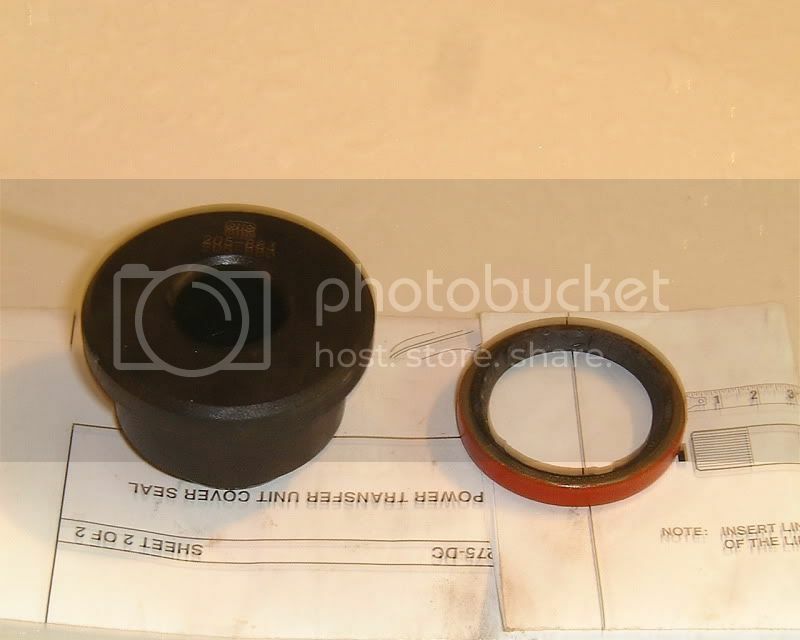 This picture is of the new shaft seal and tool 205-883. Find this at a hardware store. 36” is a good length for this job. Spin the nut on to create the tool for installing the new seal and deflector. Made from carbon steel such as Harbor Freight #91352. Useful for pulling out the old seal from the bore. Disclaimer: Don’t make me write out a long detailed disclaimer. 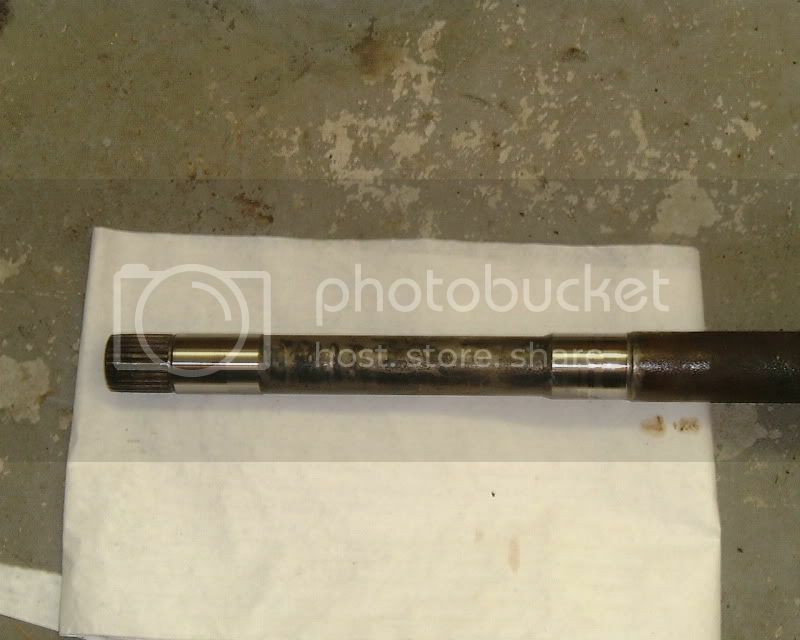 This post documents my experience of changing the intermediate shaft seal and fixing the leak. There may be errors or omissions from this post that I’ve overlooked. I did my best to provide accurate information. If something you do screws up your vehicle it’s not my responsibility. If you lack the necessary skills to complete this job then it’s not my responsibility either. 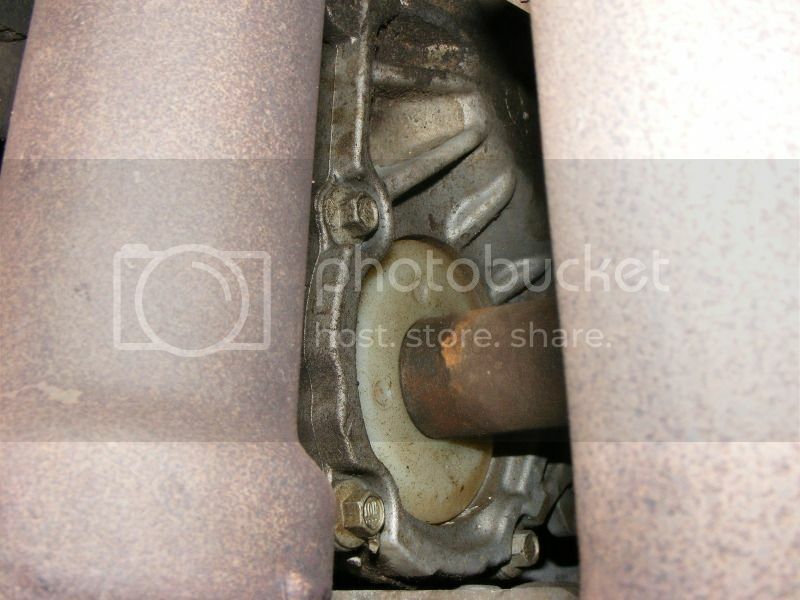 - With the 32mm socket and breaker bar loosen the axle shaft nut & remove. 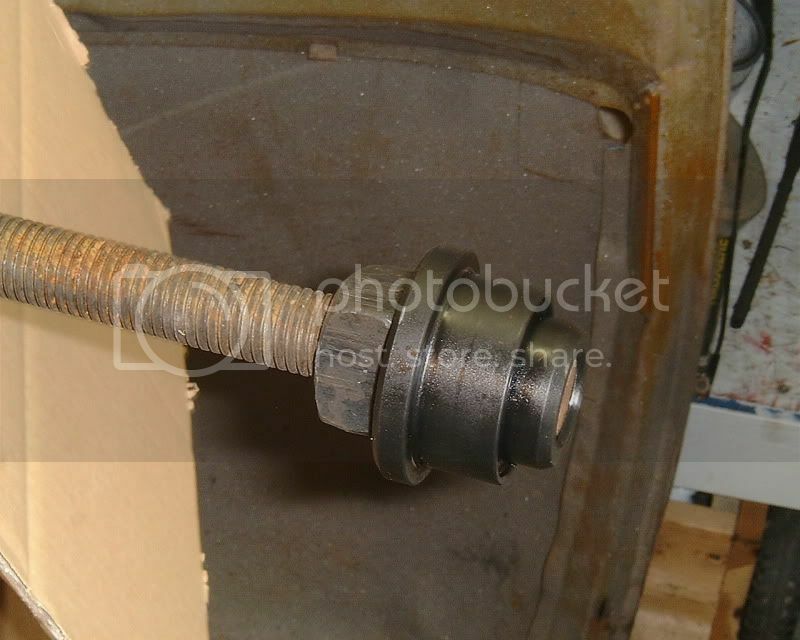 - Remove the two bolts that holds the brake carrier to the knuckle assembly. - Pull the brake caliper off the rotor and hang it from the strut spring with wire. 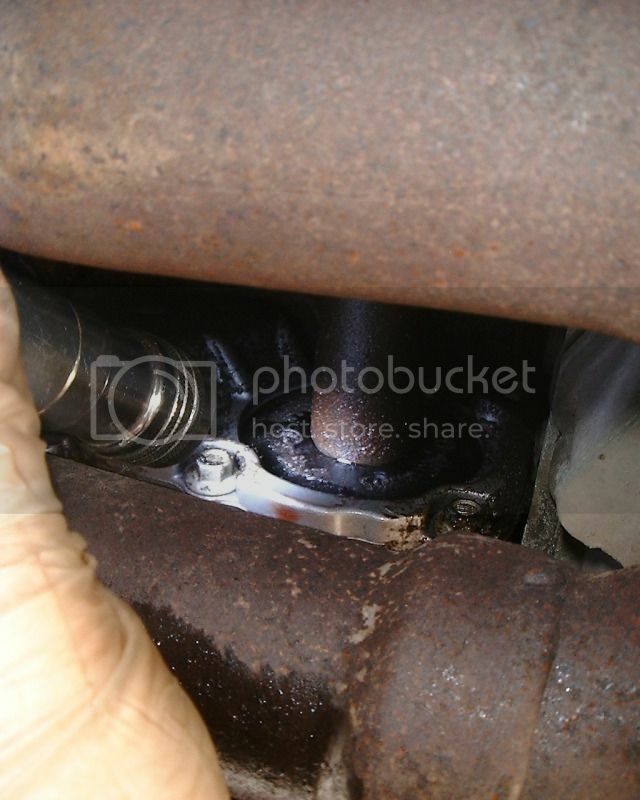 - Remove tie rod from knuckle assembly. 21mm wrench and 10mm to back up the tie rod from spinning. 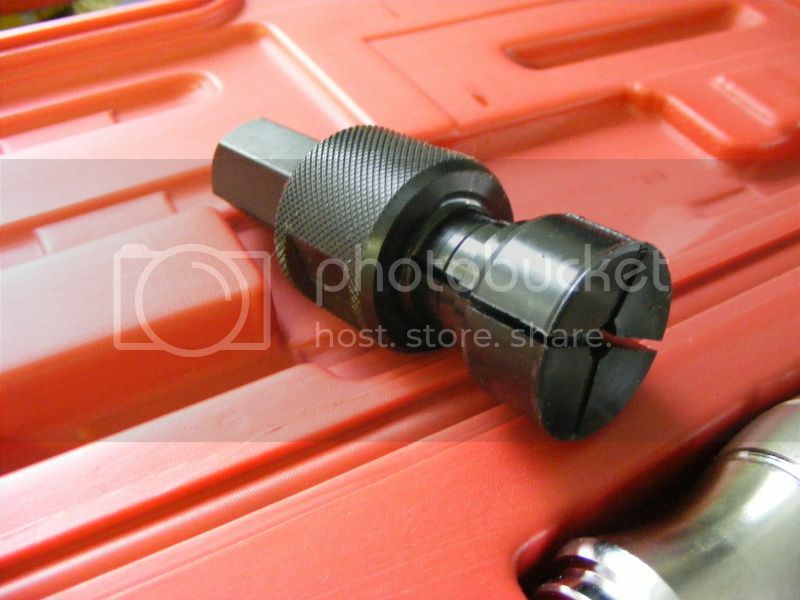 - Remove bolt from ABS sensor (8mm) and carefully pry it out of the knuckle. - Push down on lower control arm and separate ball joint from the knuckle. 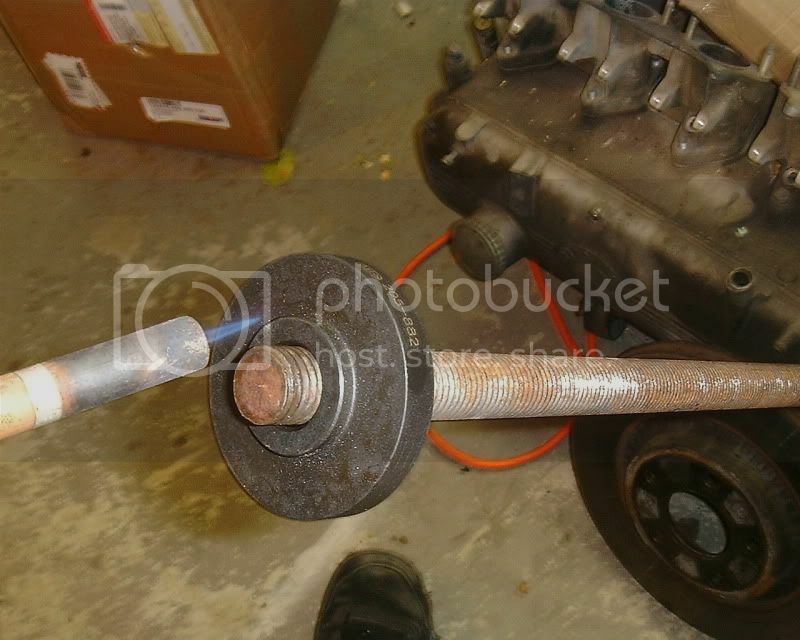 - Install puller on hub and press the splined shaft on the CV joint out of the hub. On my vehicle this was not hard to push out. - Clean the area around the deflector with brake cleaner to remove as much dirt and grit as you can. - Carefully pull the intermediate shaft out and remove. Set the shaft aside and keep it clean. Quite a bit of oil will come out with this step. - Pull off deflector and discard. Without the special too this can be a challenge. The deflector has bump on the surface that mates with a groove that’s cut into the bore. With the deflector in this groove and shaft installed, it’s impossible for the deflector to come off. Using a blind hole bearing puller could possibly work as well if it’s the correct diameter. Someone would have to investigate this. The special tool costs $200 and looks to be a bearing puller that connects to a slide hammer. The technique I used was I heated a old gasket scraper red hot with a propane torch and used that to cut the hard plastic inside the bore. I had to heat the scraper up a couple of times to get all the way through. Once cut the deflector came off easy. - With a clean finger, check there are no pieces of deflector still inside the PTU. 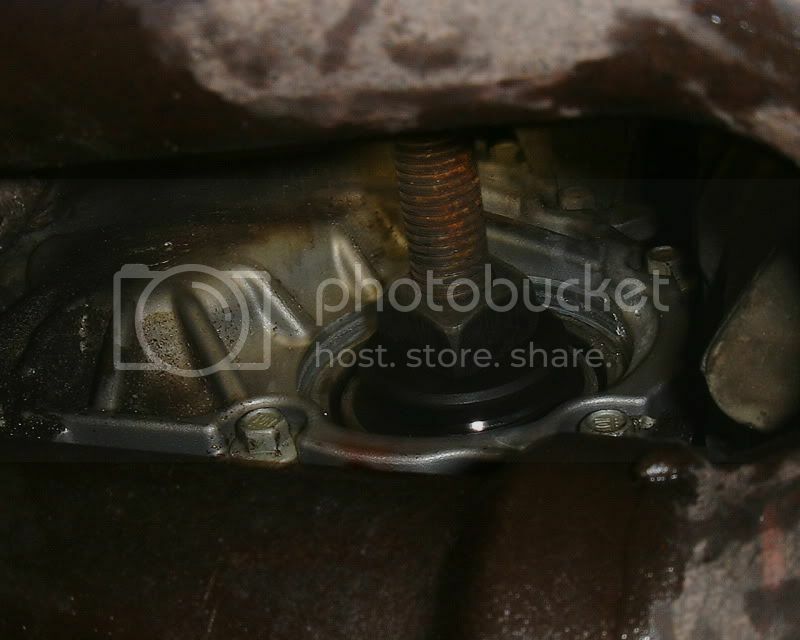 - Reach in and pull out the intermediate shaft spacer. It should come out easy by finger. If not, use the seal puller and work it out. You shouldn’t need to use force. - Again with a seal puller, pull out the intermediate shaft seal. Pull one side at a time and work it out. It will be in there tighter than the spacer but don’t force it. Here’s a picture of the old spacer beside the new…. Notice the wear. - Inspect for any debris left behind from the last steps. If necessary, wash out debris with a spray of brake parts cleaner. - All during these steps there will be a slow flow of ATF dripping out where the intermediate shaft was. Keep the drip pan in place. 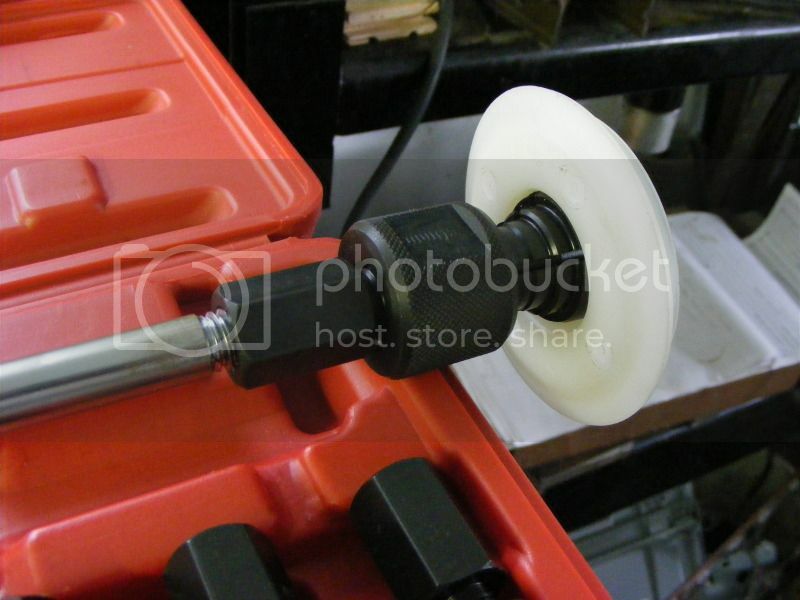 - Slip OTC tool 205-883 onto the threaded rod so it rests on the nut. Check the end for nicks or burrs that could cut the seal. - Coat tool 205-883 with a light coat of ATF then slip the seal onto the tool facing the correct way. - The seal will come coated with black grease. Do not remove this grease. - Feed the treaded rod in from the passenger wheel well and center it over the opening. - When straight, hammer the seal in place. Seat it completely with tool 205-883. - Remove the rod. Remove the seal installer. - Insert the intermediate shaft spacer and press it all the way in by hand. - Heat the threaded rod and tool 205-882 with a propane torch to a temperature of around 100˚C. If you don’t have a infrared thermometer you could use this trick. Heat up the tool with the torch. Test it’s temperature by placing a single drop of water on the installer. If the water boils it is too hot, let it stand for a minute to cool and repeat until the drop of water doesn’t boil. - Once the installer is up to temperature, drop the deflector onto the installer and check it’s temperature with the thermometer. It should be between 60 and 100 degrees C.
- Quickly feed the rod in from the passenger wheel well and position it over the hole. - With a 3lb or 5lb hammer drive the deflector on. With 2 or 3 hits with a 3lb hammer my deflector snapped into place. The TSB says you can hit the deflector quite hard, just ensure it’s up to temperature first otherwise you risk breaking it. Sorry, no pictures of this step. - Check to see the lip of the deflector is 3mm to 5mm below the surface of the PTU housing. - Install the seal protector in the opening. - Clean off the intermediate shaft with brake parts cleaner to insure no dirt or sand is on the splines or shaft. - Insert the intermediate shaft. Using a bit of force to push past the seal protector. Insert up to a point between the marks. - Finish inserting the intermediate shaft until it bottoms. Line up the support bearing onto the two threaded studs at the same time. - Once the vehicle has been lowered back onto its tires. 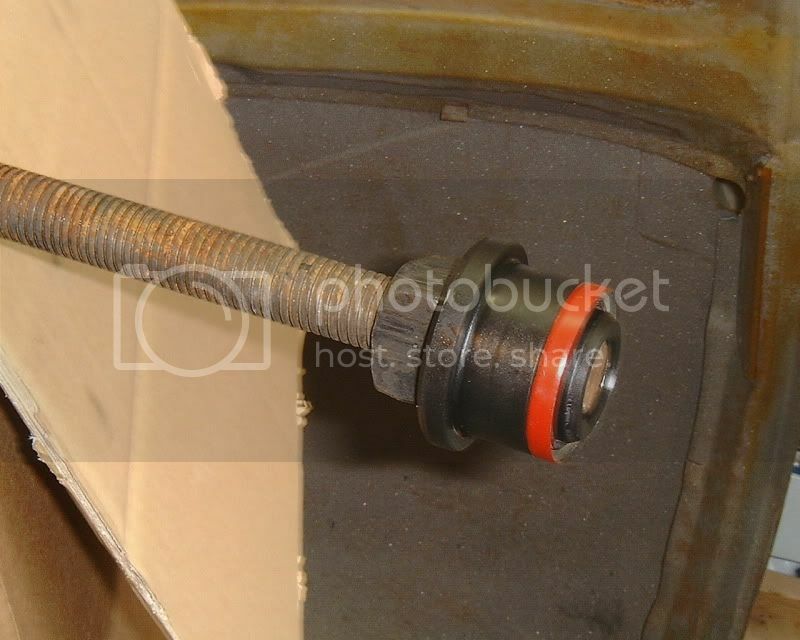 Apply a drop or two of blue threadlocker to the axle shaft threads and install the nut. 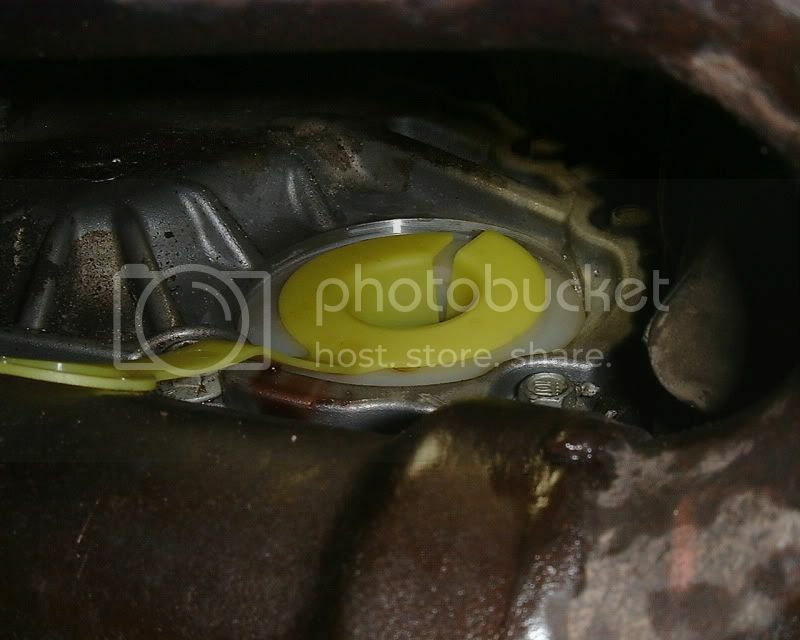 - Check for leaks, re-check fluid level once the transmission has warmed up. - The first drive should burn off the residual oil left on the exhaust pipe. Before I repaired this my 2009 Taurus X would drip ATF everyday onto my driveway making stains about 12” in diameter. The smoke it would make in the cabin was unbearable at times. During cold weather the leak would get worse but towards the end there wasn’t a day that would go by that it wouldn’t leak. It’s been a couple of weeks now since I fixed it and it hasn’t dripped once and absolutely no more smoke. Thanks for reading and work safe! Last edited by Trevor M on Sat Jul 28, 2012 2:12 pm, edited 1 time in total. Thank you for the awesome write up. I'm on the Saturn forums and a DIY thread like this would definitely gain "sticky" status. Excellent work! My T-rex is under warranty so I"m going to check the seals and have them done if there is any oil. If it happens later when my warranty is up. I'll be checking here to make the repair. Just had mine done 6 weeks ago under Ford Certified warranty. Thank god my local shop had caught it while doing an oil change as I imagine this is an expensive fix. The Ford dealer took three days fixing it, I had a $200 deductible. Great write up. I took the liberty of posting it over at FordFlex.net. Hope you don't mind. Thanks and no I don't mind. The more people it can help the better. When I was researching for info on this before I did the repair, I didn't find much which was discouraging. After I did the repair I thought I'd share. My T-Rex Limited not AWD but man that is a great write-up. Thanks for posting. Trevor, if you were to get this done at the dealer, retail would cost 2-3 hours labor, plus parts. I am a tech at a local dealer and we do these on a regular basis. Most of the time it's warranty, but we still do some retail, too. It's not a hard job, but much easier if you have the correct tools as you have illustrated. Great pix, too! The illustrations are right out of the service manual. Been meaning to update this for a while now. Been quite busy wrenching on my BMWs and don't often have a chance to stop by the Freestyle forum. When I first wrote it I really didn't have a solution for removing the nylon deflector. And maybe you noticed I glossed over that part When I did the seal I removed the deflector by breaking it out in pieces and melting the plastic which was far from the correct procedure. I needed to be very careful not to damage anything else besides the deflector otherwise I would have had a very expensive repair to deal with besides the seal. I found a tool which closely duplicates the one recommended by the factory. It's a blind hole bearing puller. The one I bought came as part of a set and the largest size (30mm) is a perfect fit for pulling the nylon deflector. The set is something I treated myself to. Not just for this job but it's useful for all sorts like clutch pilot bearing for example. Basically how it works is the puller is inserted into the center hole of the deflector and tightened down. 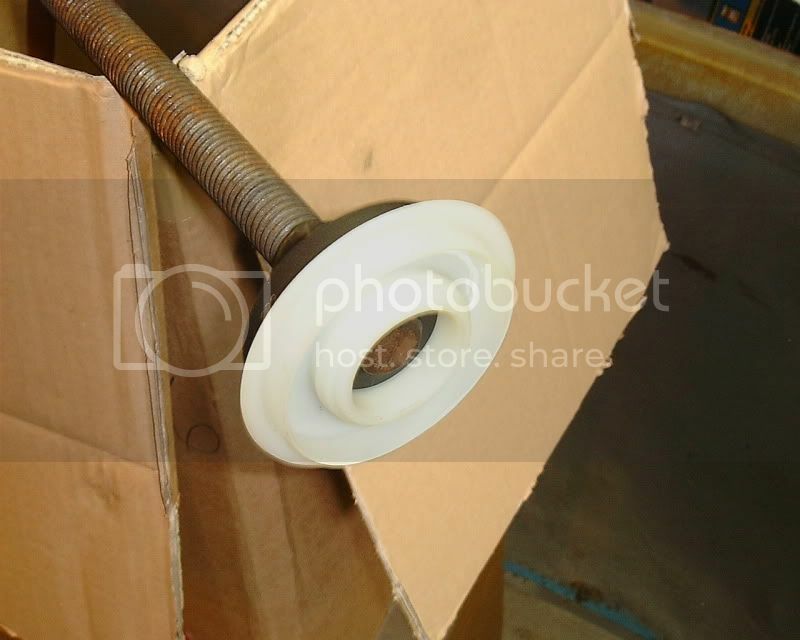 This causes the puller to expand within the hole and grip the inside edge. Shown below is the puller installed on a new deflector and in the expanded position. 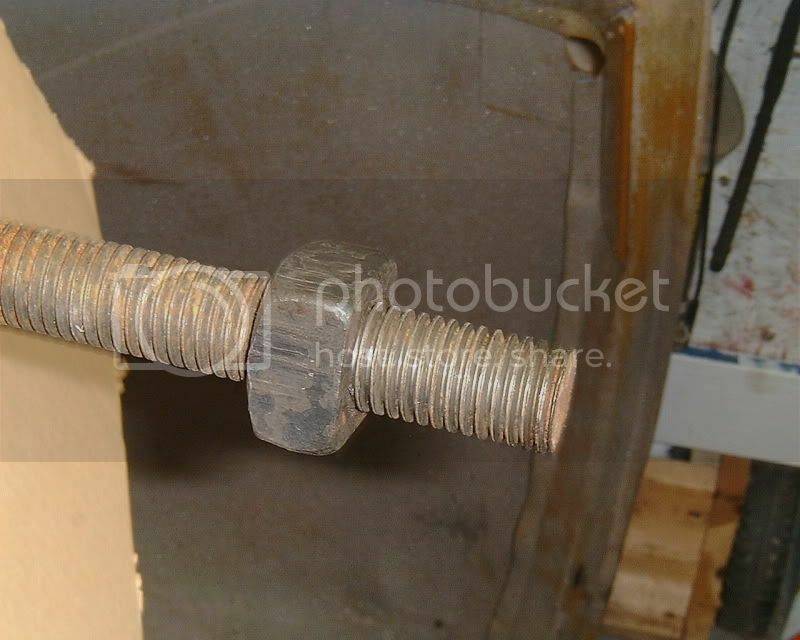 Once installed, a slide hammer is screwed into the back of the puller. I guess you can figure out the rest. Had the T-rex up in the air today getting a flat fixed and decided to peek and see if it's been leaking. After 5 months there's not a drip! can you buy the kit online. mine is leaking gear oil. ITs leaked atf in the past, so this would be the second fix. I want to buy the whole kit, do you know who sells it? bran1har wrote: can you buy the kit online. mine is leaking gear oil. ITs leaked atf in the past, so this would be the second fix. I want to buy the whole kit, do you know who sells it? If you Google the part number you'll find lots of online suppliers for the kit. Me being in Canada had a hard time finding A) a Canadian supplier; and B) a US supplier that would ship internationally. But I did find one and it worked well for me. Local dealership (Ray Schultens in The Dalles, OR) fixed my '08 yesterday at 35,071 miles. Service history showed that the seal(s) had been done before. It took the tech a little over 2 hours and there was no charge for the repair. This may be useful. PTU section from service manual. bran1har wrote: This may be useful. PTU section from service manual. Does anyone know why this seems to be more of a Taurus X issue and not a Freestyle issue? Did Ford/Volvo change the design of the seal? 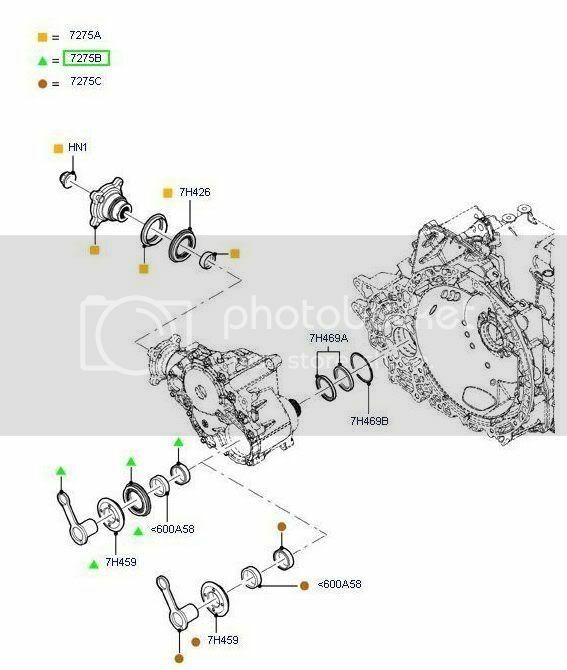 Does this post apply to a 2005 ltd awd fs? At 230k (cvt replaced at 154k). Leak is not yet serious and can only smell the burning fluid for a few moments when stopped then goes away. Thanks.